CLI526Y Yellow X 5 (1010 Photos). CLI526Y Yellow X 3 (606 Photos). CLI526Y Yellow X 2 (404 Photos). The MG8150 is a Canon’s top range multifunction printer that has every feature a home user could think of. 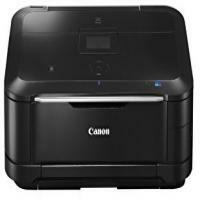 The printer is designed to have excellent photo print quality feature, a scanner for documents or negative-photo printing, larger LCD display accompanied by a smart touch panel, wireless connectivity and direct printing support. The printer uses six individual Canon Pixma MG8150 Ink Cartridges, which adds grey to the usual 5-ink CMYK version. The Canon Pixma MG8150 can print with the print resolution of 9600 dpi. It is comparatively expensive than the MG6150 and has almost same features except for the negative scanning. The MG8150 is 470 x 392 x 199 mm in its dimensions, has a 3.5 in LCD screen in the centre of the printer’s top panel, weighs 10.7 kgs and has an easily understandable graphical interface for its users. Furthermore, the printer prints at a speed of 12.5 ppm and 9.3 ppm in black and white and coloured one respectively. It uses two main paper trays one with 150 sheet cassette sliding in the front and a second one is the 150 sheet tray pulling up at the rear. It is recommended to use a cassette for plain paper or document printing and the rear feed for photo printing. If you are looking for a printer that can print good quality photos and negatives too, then Canon Pixma MG8150 will work for you. It is an expensive printer, when compared to its other printers range, but make use of compatible Canon Pixma MG8150 Ink Cartridges that work same as the originals and are low in cost. What should be done if colours printed are wrong or white streaks appear on the printout? Check 2: Check the status of your ink tanks. You must replace the ink tanks if the ink has run out. Check 3: Is the orange tape or protective film remaining? Make sure that the protective film is peeled off. If the orange tape is left on the Canon Pixma MG8150 Ink Cartridge, pull the tape off and remove it. Check whether the colour Canon Pixma MG8150 Ink Cartridge is not empty. Clean the printhead and try printing the nozzle check pattern again. If the issue is still not resolved, turn off your printer and perform another deep cleaning process after 24 hours. If the problem is not resolved after performing the printhead deep cleaning twice, the printhead might be damaged. Contact the service center for it. Check 5: When using paper with one printable surface, make sure that the paper is loaded with the printable side facing up. Printing on wrong side of the paper may cause unclear prints or prints with reduced quality. Refer the instruction manual supplied with the paper for detailed information. Check 6: If platen glass dirty? Check 8: Did you copy a printout done by this machine? Printing from either of the things a memory card, USB flash drive, a digital camera directly, or reprint from the computer, if you copy a printout done by this machine, print quality may get declined. Q. I’d like to buy Canon Pixma MG8150 ink cartridges from you but only if you provide a warranty on them. Can you please help? A. All our cartridges come with warranty, services and support that guarantee the best experience and value for money deals. We would recommend you to place your order and be sure you will not be disappointed. Q. Are the compatible Canon Pixma MG8150 ink cartridges (in a multipack of 25) chipped? A. Yes, all the 25 compatible ink cartridges in a multipack, are chipped. A. No, Canon Pixma MG8150 compatible ink cartridges do not cause damage to printers. Compatible cartridges are identical to original cartridges in design and make and work in the same manner. You can be sure that these compatible cartridges are not different from the original ones and suitable for use. Q. Can compatible ink cartridges like Canon Pixma MG8150 ink cartridges last for more than a year after date of manufacture? A. The shelf life of these Canon ink cartridges is easily up to a year from its date of manufacture. If the cartridges are maintained well and kept in unopened packaging their lifespan can extend and go up to two years. Q. I recently bought a multipack of Canon Pixma MG8150 ink cartridges so I can use them in Canon Pixma MG5350 printer too. But now I’ve started having second thoughts about installing them in Canon Pixma MG5350 as both are different code numbers. A. Please rest assured that these cartridges work perfectly with Canon Pixma MG5350 printer, and as well as they do with Canon Pixma MG8150. Both are compatible, which means they can be paired together. Q. Are your compatible Canon Pixma MG8150 ink cartridges chipped? A. Yes, our compatible Canon Pixma MG8150 ink cartridges are chipped and are easy to install as the original ones. Q. Is automatic duplex printing supported on Canon Pixma MG8150? A. Yes, automatic duplex printing is supported on Canon Pixma MG8150. The sizes of media suitable for automatic duplex printing are A4, Letter, A5, and B5. Q. What types of memory are supported by Canon Pixma MG8150? A. The types of memory supported by Canon Pixma MG8150 include: CompactFlash, IBM Microdrive, USB flash drive, Memory Stick, Memory Stick Duo, Memory Stick PRO, Memory Stick PRO Duo, MultiMediaCard, MultiMediaCardplus, SD Memory Card, SDHC Memory Card. Q. Can I use Canon Pixma MG8150 to print on CDs and DVDs? A. Yes, Canon Pixma MG8150 can be used to print to CDs and DVDs. Q. Can I expect the same quality of output as original from the compatible Canon Pixma MG8150 Ink Cartridges? A. Yes, we guarantee that you will be satisfied and won’t be making any compromise on the print quality. These are FSC tested products and produce the same quality of output as original cartridges. Furthermore, all our ink cartridges come with a money-back guarantee. Q. What are the dimensions of Canon Pixma MG8150 and how much does it weigh? A. The dimensions of this printer are:- 470 mm (Width) x 392 (Depth) x 199 mm (Height). It weighs around 10.7 kg. Q. What is the maximum print resolution that a Canon Pixma MG8150 can produce? A. A Canon Pixma MG8150 printer can produce print resolutions up to 9600 x 2400 dpi. Q. What interfaces can be used to connect Canon Pixma MG8150? A. The interfaces supported by Canon Pixma MG8150 are USB, Wlan or Wifi, LAN, IrDA and Bluetooth. Q. I purchased Canon Pixma MG8150 ink cartridges from your website. They are not compatible with my printer. Can I return these cartridges for a refund? A. Yes, you can return these items as long as they are not faulty. Please contact us by telephone on 048 30833221 or email us on info@printerinkcartridges.ie within 30 days of purchase. You must return these items unused and in their original undamaged packaging and in a re-saleable condition. Q. How many copies can Canon Pixma MG8150 make at a time? A. A Canon Pixma MG8150 can make a maximum of 99 copies at a time. Q. Can I print photos and graphics using only black ink on my Canon Pixma MG8150? A. Unfortunately, printing photos and graphics using only black ink is not possible. Even if you select grayscale printing, the printer will continue to use a combination of other colour inks. It uses a combination of both black and coloured ink to produce composite black for images and graphics. Q. Can I take printouts directly from my mobile device? A. Yes, you can easily take prints from your mobile device. You can use Bluetooth, Infrared or the Canon Print Inkjet/Selphy app on an Android or iOS device. Q. Can I take photo copies on Canon Pixma MG8150? Q. What if my order of Canon Pixma MG8150 ink cartridges turns out to be damaged? What is your refund policy for such a situation? A. If the items turn out to be damaged, please contact us at by telephone on 048 30833221 or email us on info@printerinkcartridges.ie. Damaged/Faulty items need to be returned to Wholesale Ink Ltd, 25 Kilmorey St, Newry, Co Down, BT34 2DF. We will arrange for a replacement or a refund for the cartridges and the postage incurred by customer for returning item once the item has been returned to us and tested. Q. Do your compatible Canon Pixma MG8150 ink cartridges come with warranty? A. Yes, all our products are FSC tested and certified and come with warranty.